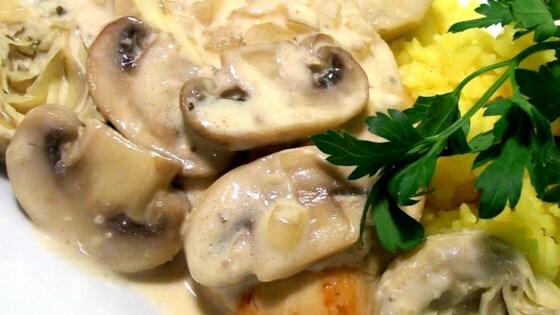 "Chicken breasts with mushrooms and artichokes in a white wine cream sauce. This is my personal favorite. Serve with saffron rice, a green veggie of your choice, and the rest of the wine, of course! Enjoy!" Place chicken in a 9x13 inch baking dish. Bake for 25 to 30 minutes, or until chicken is no longer pink and juices run clear. While the chicken is baking, place the chicken stock, garlic, and onion in a medium saucepan. Bring to a boil, and cook until liquid is reduced by half. Stir in wine, and continue to cook until reduced and slightly thickened. Add the mushrooms and artichokes to the chicken stock mixture. Reduce heat, and simmer until mushrooms are tender. Stir in the heavy cream, and cook, stirring occasionally, until thickened. Season with salt and pepper, and serve over the baked chicken. Delicious sauce. Per previous comments, I used marinated artichoke hearts. The sauce was extremely thin - I recommend thickening it with some cornstarch.